To help instill calm and focus in children with learning challenges, The Shadow Project has provided more than 100 teachers in two school districts with sensory toolkits, and then trained them on introducing sensory tools in their classrooms. Sensory tools are intended to build self-regulation, that is, helping children manage their behavior and thinking so they can listen, pay attention, and persevere through challenging or frustrating learning experiences. Nationally published research from Oregon State University found that at-risk children with stronger self-regulation skills score higher in reading than those with weaker regulation. 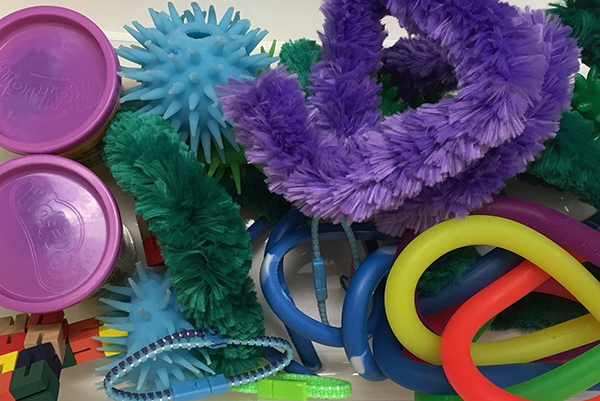 Shadow staff, in collaboration with occupational therapists, have trained more than 100 Portland area teachers on sensory tools for focus and calm in the classroom. The tool kits are a condensed version of the SuperSensory Literacy Spaces that Shadow has created for special education classrooms. Teachers received two-part trainings from The Shadow Project on introducing sensory tools into their classroom. Each teacher received a box of occupational therapist-approved handheld fidgets, a box of kinetic sand with tools, and an oversized comfortable chair. In a 2017 evaluation of a sensory training pilot at Rosa Parks, 71% of teachers reported that their students who use sensory tools are less anxious; 50% reported students spend more time reading, and 62% noticed a reduction in disruptive classroom behavior. “To introduce the tools, we talked about how a fidget is a toy if it is used the wrong way,” said Patrice Pierre, third grade teacher at Rosa Parks, who says 70% of her class this school year regularly use fidgets. “If I have to take it away for being a toy, I will stop the whole class and make that a teachable moment for everyone. I think a lot of people expect that fidgets will just work. That’s not how we teach. I’m about giving them a chance because the fidgets really do help the kids. You have to see who it’s going to work for, and the kids who it won’t work for, and adjust. “For us, it has become routine now. It may not work for everyone and that is a realization kids come to also. I wouldn’t have thought they would work so well for practically my whole class.